A diet called The Blood Type Diet has been popular for almost two decades now. Proponents of this diet suggest that your blood type determines which foods are best for your health. There are many people who swear by this diet, and claim that it has saved their lives. But what are the details of the blood type diet, and is it based on any solid evidence? The blood type diet, also known as the blood group diet, was popularized by a naturopath called Dr. Peter D’Adamo in the year 1996. His book 'Eat Right 4 Your Type', was incredibly successful. It was a New York Times bestseller, sold millions of copies, and is still wildly popular today. In this book, he claims that the optimal diet for any one individual depends on the person’s ABO blood type.He claims that each blood type represents genetic traits of our ancestors, including the diet they thrived on. Type A: Called the agrarian, or cultivator. People who are type A should eat a diet rich in plants, and completely free of “toxic” red meat. This closely resembles a vegetarian diet. Type B: Called the nomad. These people can eat plants and most meats (except chicken and pork), and can also eat some dairy. However, they should avoid wheat, corn, lentils, tomatoes, and a few other foods. Type AB: Called the enigma. Described as a mix between types A and B. Foods to eat include seafood, tofu, dairy, beans and grains. They should avoid kidney beans, corn, beef, and chicken. Type O: Called the hunter. This is a high-protein diet based largely on meat, fish, poultry, certain fruits and vegetables, but limited in grains, legumes, and dairy. It closely resembles the paleo diet. Many people have experienced positive results by following the diet. However, this does NOT mean that this may in any way be related to their blood type. Different diets work for different people. Some people do well with a lot of plants and little meat (like the type A diet), while others thrive by eating plenty of high-protein animal foods (like the type O diet). If you got great results on the blood type diet, then perhaps you simply found a diet that happens to be appropriate for your metabolism. It may not have had anything to do with your blood type. Also, this diet removes the majority of unhealthy processed foods from people’s diets. Perhaps that is the single biggest reason that it works, without any regard to the different blood types. That being said, if you went on the blood type diet and it works for you, then by all means keep doing it and don’t let this article dishearten you. Bottom Line: Not a single, well-designed study has been conducted to either confirm or refute the benefits of the blood type diet. Like they say- "If your current diet ain’t broken, don’t fix it". 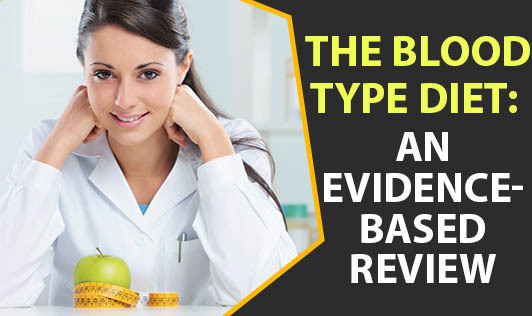 From a scientific standpoint, however, the amount of evidence supporting the blood type diet is particularly underwhelming.